Distracted driving is a top reason our roads are increasingly dangerous and crowded. According to the National Safety Council, traffic fatalities in the US are rising at the fastest rate in 50 years, with 68% of crashes caused by distracted driving — the cause of nearly 3500 deaths each year. In the million-plus miles we have accumulated from vehicles on the Nauto system, there’s a distraction event once every 4 miles. Most drivers are guilty of it, but it doesn’t make it less egregious: a driver glancing at a text message takes his or her eyes off the road for an average of 5 seconds — but that’s the amount of time it takes a vehicle traveling at 55 miles per hour to go the distance of a football field. Think about that. Nauto 2 automatically detects, makes video notations and uploads distraction events to a secure dashboard app. Figuring out a way to detect and give feedback on distracted driving has been a huge concern for the commercial fleets and professional drivers we work with every day. 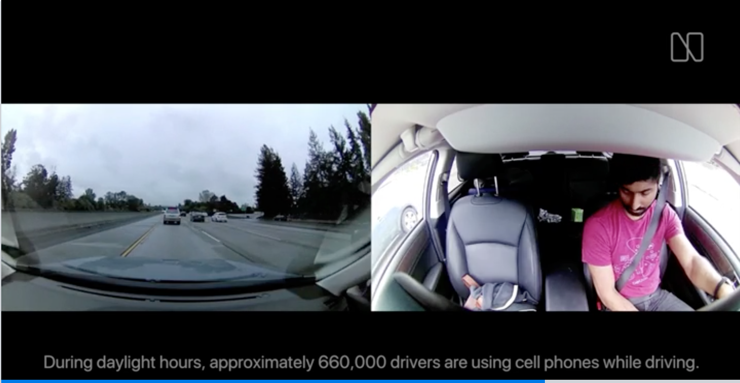 So we harnessed Nauto’s AI powered cameras and network and created a way to not only detect distraction events, but to give them visual context, score them based on their relative risk factor, and automatically upload them to a secure dashboard app. I’m pleased to confirm that it’s been rolled out to our customers. More details are in our press release below. You can see examples of how Nauto detects, notes, scores and automatically uploads video clips of distraction events at this video here. It’s yet another way we’re working hard to make fleets and those who drive for a living safer and smarter behind the wheel. The more accurately Nauto can observe human driving behavior, the smarter we can make the professional drivers who depend on us, and the safer we can make our streets and highways. Palo Alto, CA, May 3, 2017 — Nauto, the transportation technology company whose data platform is making driving safer and fleets smarter, can now detect and notate distracted driving in its new, upgraded Nauto 2 system, rolling out to commercial fleet customers in North America. The distraction feature is the automotive industry’s first aftermarket platform that uses video and artificial intelligence to detect whenever a driver’s eyes divert from the road or engage in other distracted behavior; it then automatically uploads it and scores the event’s severity via a secure app. The upgraded Nauto 2 system launches at a time when traffic fatalities in the US are rising at the fastest rate in 50 years, with 68% of all crashes caused by distraction and 3500 of them ending in fatalities each year (National Safety Council, February 2017). (National Safety Council, February 2017). Nauto is an automotive data platform, powered by artificial intelligence and an after-market dual-camera device, which can equip any vehicle or fleet with sophisticated safety and networking features. The Nauto 2 system also includes a new windshield mounted hardware design, updated deep learning and computer vision algorithms and smart cloud network informed by the accumulation of more than a million miles on urban streets and highways. Nauto’s scoring system, called VERA (Vision Enhanced Risk Assessment) includes a risk rating for the frequency and severity of distraction events (for example, a distraction event while stopped at a red light would not generate the same high risk score as a distraction event that occurred at 65 mph speed on a freeway). Because Nauto learns from other drivers, the road and conditions around vehicles in the Nauto network, fleets equipped with Nauto have access to valuable features, such as automatically uploaded video of significant events and insights delivered in real time to help fleet managers improve overall driver performance and enhance the safety and efficiency of an entire fleet. CEO and Founder, Nauto. Stanford. McKinsey.